I wonder what the breakfasts will be like at Blue Pearl on Hamilton Island! 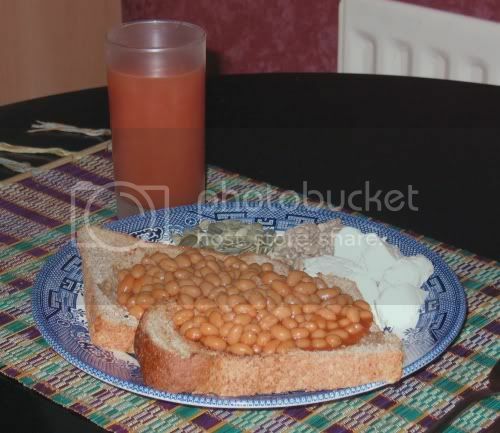 Mixed Fruit Juices (Grape, Orange, Mango - not from concentrate), Brown Wholemeal Toast with Organic Butter, Baked Beans, Mozarella Cheese, Sunflower Seeds, Pumpkin Seeds. Coffee, Brown Wholemeal Toast with Organic Butter, Fresh Egg and Tomato Tortelloni Pasta filled with Tomatoes, Basil and Cheese. 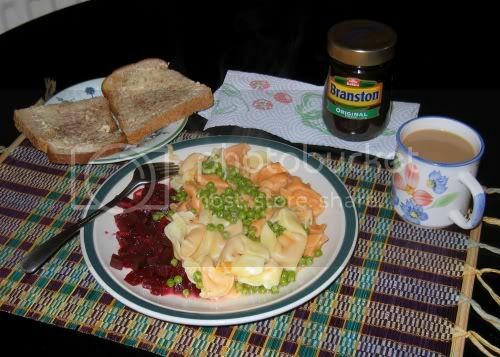 Carrot, Onion and Beetroot Salad with Orange Dressing, Organic Peas (Petits Pois), Mixed Vegetable Pickle (Branston). 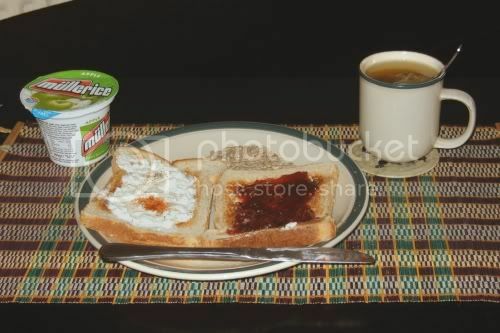 Coffee, Probiotic Strawberry Yogurt Drink, Brown Wholemeal Toast with Organic Butter, Strawberry Conserve, Columbian Fair Trade Banana with Sugar, Flame Grilled Chicken with Cayenne Pepper. 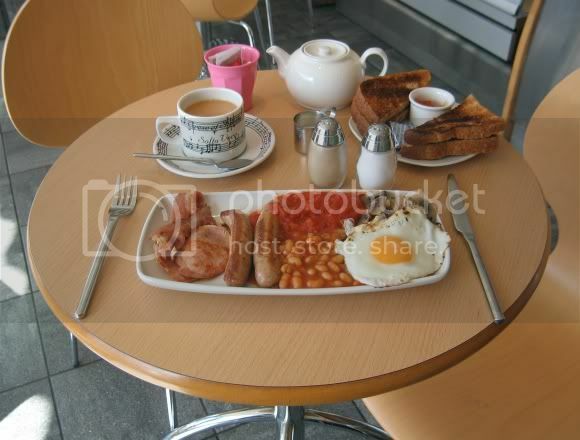 Normal Tea (Indian) with Milk and Sugar, Brown Toast with Butter and Marmalade, Bacon, Sausage, Chopped Tomatoes, Baked Beans, Fried Egg, Mushrooms, Salt and Black Pepper. 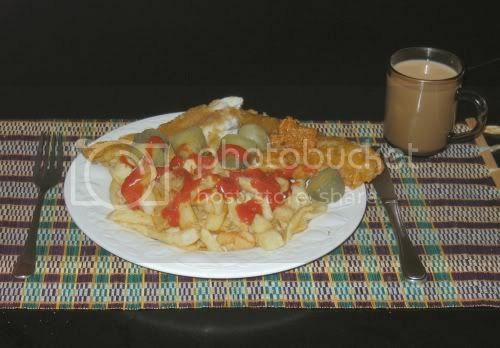 Haddock, Chips, pickled Dill Gherkin, Lime Pickle, Salt, White Pepper, Ketchup, Malt Vinegar, Coffee. 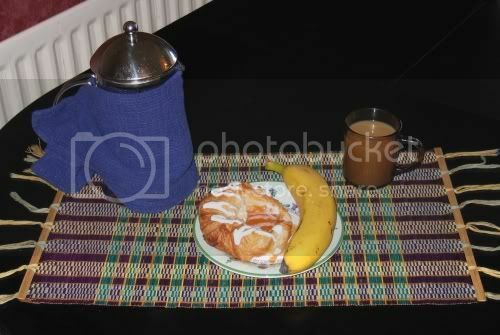 Coffee, Apricot Danish Pastry, Fair Trade Columbian Banana. 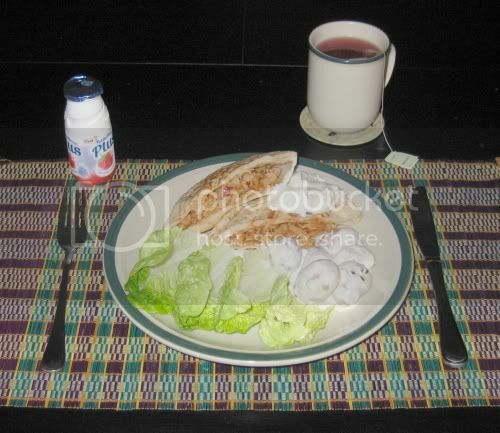 Probiotic Strawberry Yogurt Drink, Blackcurrant Ginseng and Vanilla Tea, Honey and Chilli Chicken in Pitta Bread, Onion and Garlic Dip, Potato Salad, Little Gem Lettuce. Followed by three After Eight Mints, more Tea and the movie "Lost In Translation". 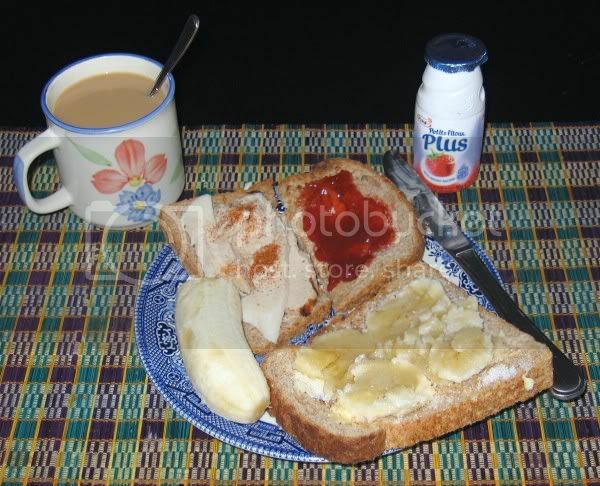 Apple Mullerice, Camomile and Spiced Apple Tea, White Wholemeal Toast with Organic Butter, Strawberry Conserve, Cottage Cheese with Pepper - Black and Red (Cayenne), Hulled Sunflower Seeds. 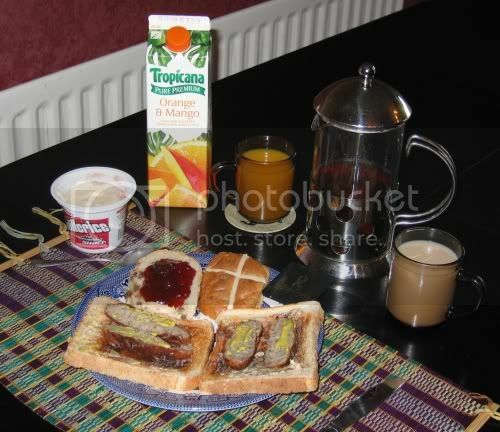 Raspberry Mullerice, Orange and Mango Juice (not from concentrate), mixture of Teas with Milk (Rooibos and Dr. Stuart's Echinacea Plus), Hot Cross Bun with Strawberry Conserve, After Eight Mint, White Wholemeal Toast with Organic Butter, Sausages with English Mustard.